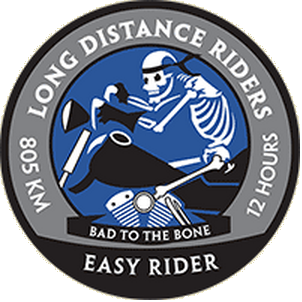 I have been formally interested in Long Distance Riding since October 2010. Most of my early rides were on my ’09 Harley-Davidson Road King’ bought new and which has done over 65,000kms. In August last year I bought a Yamaha XT1200Z Super Tenere for the Long Distance Rides and give the Harley a break and have ridden it 33,000 kms in six months. I have two other bikes, a Kawasaki KLR-650 and a Yamaha TTR-250. I work in Information Technology, mostly web related stuff, and have a very understanding wife and three children. I have enjoyed every ride I’ve done, I’m happy on any bike rain hail or shine. The Coast to Coast was a big challenge. No freeways on that route and night riding exposes you to a plethora of kangaroos, cattle, sheep, wombats and camels as the roads are largely unfenced. 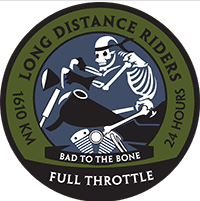 However I think my favourite ride was a 1670km ride in 21hours on my TTR-250 with my friend riding my KLR. That was a long day full of huge laughs and lots of fuel stops with the TTR only having a 120-140km range at highway speeds. 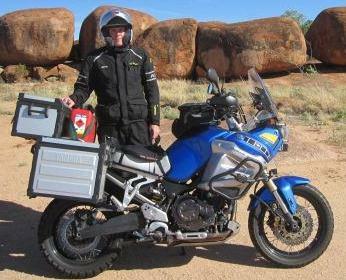 My two year goal is to do a lap of Australia including riding 16100kms (10,000 miles) in ten days. My longest single ride to date is 8170kms in five days (5070 miles). But before that, back to back Coast to Coast.